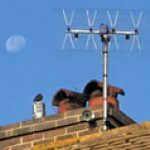 There are two types of TV Aerial installations and two types of Radio Aerial installations that we can provide. 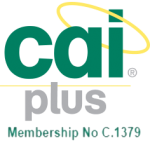 All of our installations use CAI/Digital UK Benchmarked/Approved Cables and Aerials, so you can be assured that the equipment supplied has passed rigorous performance tests. We have listed the most common installations below, but if you do not see what you require please contact us. All of these installations can be tailored to your needs, for example should you be looking at more than one point in your home we can accommodate. A standard installation would be provided where television signals are strong and a high-gain aerial is not required. 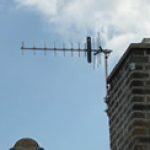 The aerial would be fitted to a chimney or onto fascia or wall brackets. New low loss double screened cable would be run to the required location. A High-Gain installation would be provided in the case where television signals are weak or where there is a need to position the aerial above any obstructions i.e. trees,buildings etc. This type of installation may also require mast head amplification depending on the strength of the signals. 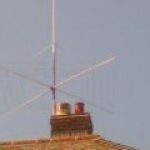 Aerial fixings are subject to the height of the mast used and should a mast head amplifier be needed then a power supply unit would be required in addition. If you have been experiencing reception problems since the changes in June 2012, it may be due to conflicts from another transmitter or 4G mobile phone signals and your aerial may need to be re-aligned to another transmitter or have a filter fitted. If the above sounds familiar contact us and we will be happy to help. There are two types of FM Radio Aerials we use. Firstly, the Omni Directional Aerial which is generally used when signals are strong and French Radio is not a problem. Secondly, the 3 Element Directional Aerial which in the main is used where signals are weaker and a reduction in French Radio signals is required. The main type of aerial we use for Digital Audio Broadcasting is a 5 Element Directional Aerial as DAB signals are generally weaker. We can provide Satellite Services for “Free to Air” to any European and North African Countries. 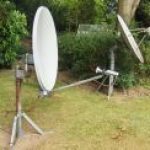 Due to the large number of services available with Satellite you can contact us direct for any advice on your particular requirements. 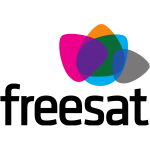 We are approved Freesat installers, providing the new Satellite Service from the BBC and ITV, for those who do not wish to pay monthly subscriptions or have difficulty in receiving Terrestrial Digital Freeview. We can supply and install Freesat, HD and HD+ receivers with Satellite dish. Please contact us for details or for a price. We can provide a fault finding service for Sky Digital, Sky +, Sky HD receivers and dishes, offering replacement equipment if required, including New Hard drives. We can install dishes to provide discreet installations at listed buildings or conservation areas (subject to survey). 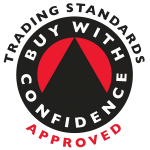 Standard and Non Standard installation charges apply to all of the above. Contact us for details.